If you are looking for home remedies for cat conjunctivitis, most likely your cat has a red and weepy eye. Conjunctivitis is the term which depicts the inflammation of the conjunctiva, the transparent tissue that covers the surface of the eye. The main function of the conjunctiva is to protect the eye by trapping debris and protecting the eye from dangerous viruses and bacteria. However, as with any tissue, the conjunctiva may be prone to irritation and infection, therefore causing conjunctivitis. Conjunctivitis is often referred to as red eye or pink eye and it is the most common eye disorder seen in cats. When a cat’s conjunctiva becomes infected, the cat’s eyes will exhibit evident symptoms. The most common symptoms seen are obviously red eyes followed by discharge. The discharge may appear watery and transparent or yellow, green and dense. It may involve one or both eyes. Conjunctivitis in cats may also be painful as the eye may burn. Cats may not cry in pain as people do as cats have a tendency to hide their pain. A painful eye in cats can be manifested by the cat squinting the eye, pawing insistently at the eye and rubbing the eye on the carpet. The nature of the discharge and the fact if the infection is limited to only one eye or both eyes may help find out the cause. When both eyes are generally affected and the discharge appears clear, allergies or systemic diseases may be the triggers. Other causes may be related to irritants such as dust, wind, and allergens which often cause eye itchiness with the cat pawing at the eye and rubbing its face. When only one eye is affected and the cat is pawing at it, it may indicate the presence of a foreign object or simply eyelashes rubbing against the eyes. When the discharge appears like mucous or pus and the conjunctiva appears red and swollen, it is very possible that the infection is caused by bacteria. Some times the secretions are so thick that the eyelids may appear sealed after the cat takes a nap. When both eyes are affected and the discharge is purulent it may indicate a virus. If the infection starts in one eye and then progresses to the other later, Clamydia or Mycoplasma may be suspected. 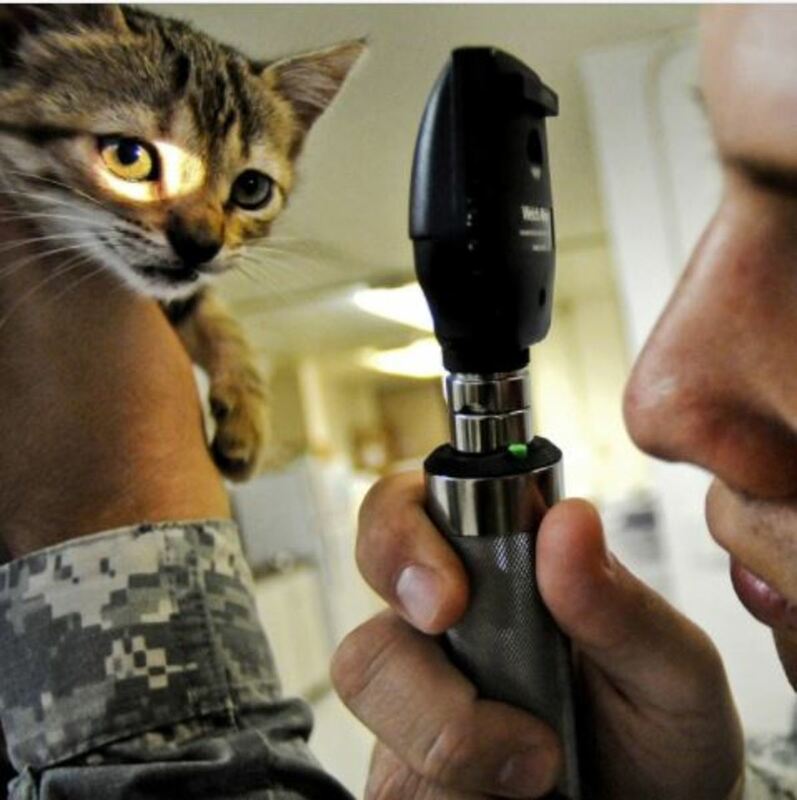 When the cat is squinting and keeping the eye shut from pain, a foreign object may be embedded or other serious eye disorders may be into play such as keratitis, uveitis or glaucoma which may result in blindness. In order to successfully treat conjunctivitis, the underlying cause needs to be addressed. Major eye disorders need to be ruled out. This is why most veterinarians advise to have pets with eye problems seen within 24 hours. Delays in treating serious eye disorders may result in major ocular damage and even blindness in severe cases. When the discharge is purulent and due to bacteria, antibiotics may be needed to clear out the infection. The antibiotics are topical in the form of eye drops or ointments and need to be given as prescribed without stopping early, even if the cat’s eyes appear to be already healing. There are really no home remedies that may help a pet once the infection has set in, however, the pet may be helped feel more comfortable at home. Clean the eye with a soft piece of cotton wool and free it from the discharge. Do not clean over the eye just around it. Do this as needed. Foreign bodies need to be excluded with a good inspection. The eye can be cleaned and flushed for a few minutes with fresh water from the faucet and it should be checked for any foreign matter. If something is identified, a q-tip may be used to carefully and gently allow the debris to stick to the cotton. Cats with watery discharge may be helped in some cases at home by applying a moist warm tea bag (just plain tea) to the eyes due to its tannin contents. The tea bag should be held against the eye for a few minutes. Simple sterile saline solution (without disinfectants) may be helpful as a temporary measure to clean the eye and give relief. Many cat owners report improvements using an over the counter cat eye infection products. There are several products to choose from, many with good reviews. Some of these products can help treat mild cat eye infections in case of conjunctivitis and secondary bacterial infections of cat eyes. There have been reports of owners healing their cats from eye problems upon rubbing one teaspoon of apple cider vinegar on their neck. As odd it sounds, some have reported success. Worth a try. However, as already mentioned, it is best to have a vet take a look at the eye/eyes if it does not seem to improve within 24 hours. There are many serious conditions out there and it is not worth risking the cat’s sight! *Disclaimer: The above article is not to be used as a diagnostic tool nor as a substitute for professional veterinary advice. If your cat is exhibiting eye problems, please refer to your veterinarian for a hand’s on examination. Thank you for all your recommendations. I will try the ACV for a feral cat. Eye drops would be impossible. Also adding lysine to food. So happy to hear about this as my wife and I live in Northern BC and we look after more cats than both SPCA’s put together and can’t get any help. Even though we have spent thousands of dollars at the local vet we still can’t get a deal in order to get them fixed. So pages like this are so helpful. I’ve seen someone squirt breast milk in an infant’s eye for an eye infection. The next day, it was totally gone. I was amazed. Apparently I’m the only one who didn’t know about this cure. Apple Cider Vinegar works wonders on our cats pink eye. We cleaned him with a warm tea bag and put 1 teaspoon of ACV soaked onto the back of his neck. We did it twice a day. It is now day 3 and the pink eye seems to be clearing out. One thing I have used is cottage cheese. We have barn cats and the kittens always seem to have this eye issue. Feed them and the mamas on cottage cheese in their diet starting about 4 weeks once a day and it has worked great! Apple Cider Vinegar–amazing! We had just moved to a new house, I didn’t have a new vet yet, and I should have known my cat would have a stress-related flair up with conjunctivitis. After Googling, I (skeptically) dabbed ACV + tiny bit of water on the back of his neck, and the next morning his eyes were almost completely clear. Within 3 days the conjunctivitis was gone. Worked faster than any medication/eye drops we had used in previous situations. I do not have a great explanation–it just works! OMG! After running out of the drops prescribed by my vet and having a VERY HARD TIME trying to apply them anyway, I tried the apple cider vinegar around the neck with my hands and last little bit over the eye,and IT WORKED! Eye looked much healthier right away… I’ll keep applying it daily and I’m thinking of applying it to my other 2 cats and 2 dogs for good measure! Is it safe for dogs? It worked?? Did you use a particular kind of ACV? I have a baby – she’s supposedly 6 weeks old – and I’ve tried Colloidal Silver, which works AMAZINGLY for people eye infections, but it isn’t doing anything. I’m PRAYING something works because she just looks awful! Yes, ACV is safe for dogs too, I use it to bathe my cats as well since most cats are very sensitive to soaps and oils. I also feed them organic coconut oil and it makes their coats very soft and shiny!